When Child Protective Services (CPS) gets a call that a child may be in an unsafe situation, the best outcome is to find a way to keep that child safely with her family. Unfortunately, that isn’t always possible, and sometimes children must be removed from their families to keep them safe. If children enter foster care, Texas leaders must make sure that kids’ lives get better, not worse. In foster care, children should not only be safe but also thrive and heal after experiencing abuse, neglect, and the trauma of removal from their families. The new federal Family First Prevention Services Act (FFPSA). 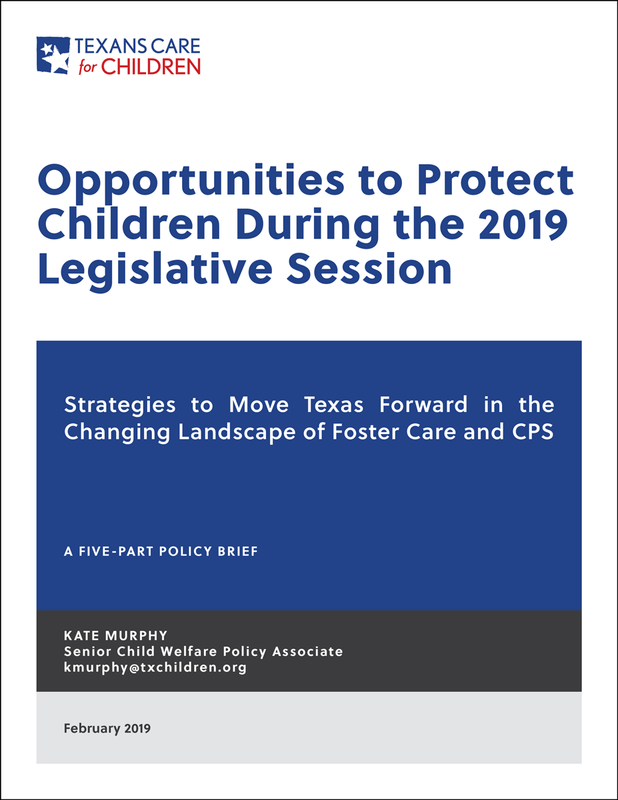 Keeping families safely together and preventing entries into foster care, including policies to address parental substance use as well as pregnant and parenting youth in foster care. Children's health and well-being in foster care, particularly policies related to kinship care, the number and kind of placements available in foster care (known as the "placement array"), and support for youth aging out of care. This brief includes legislative recommendations for each of those policy areas.